If you missed Part 1 and Part 2 of the series you can click here. In Part II of this series, we discussed brainstorming and what follows herein is further exploration of that process introducing terms widely used to describe creative thinking. Hopefully, this will help you build on simple brainstorming, making it more valuable for your jewelry making. Following this introduction, I will show you the creative thinking I used to develop some different shapes for metal earrings. 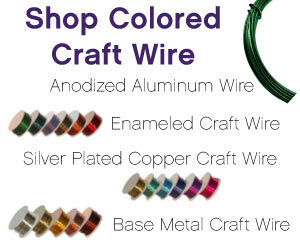 I’ll also reference the wire wraps I used on some cabochons. Four of the main components of creative thinking are fluency, flexibility, originality and elaboration (aka FFOE). These are the areas measured most often on tests of creative thinking. I also believe that resistance to premature closure bears discussion because of its importance in generating ideas. The photo below shows a variety of wire-wraps for stones that help document the terms we’re talking about. As you read the discussion you might refer back to these pieces to look for evidence of fluency, flexibility, originality and elaboration. Fluency is shown when we produce a quantity of ideas through brainstorming as discussed in Part I of See Yourself as a Creative Thinker. 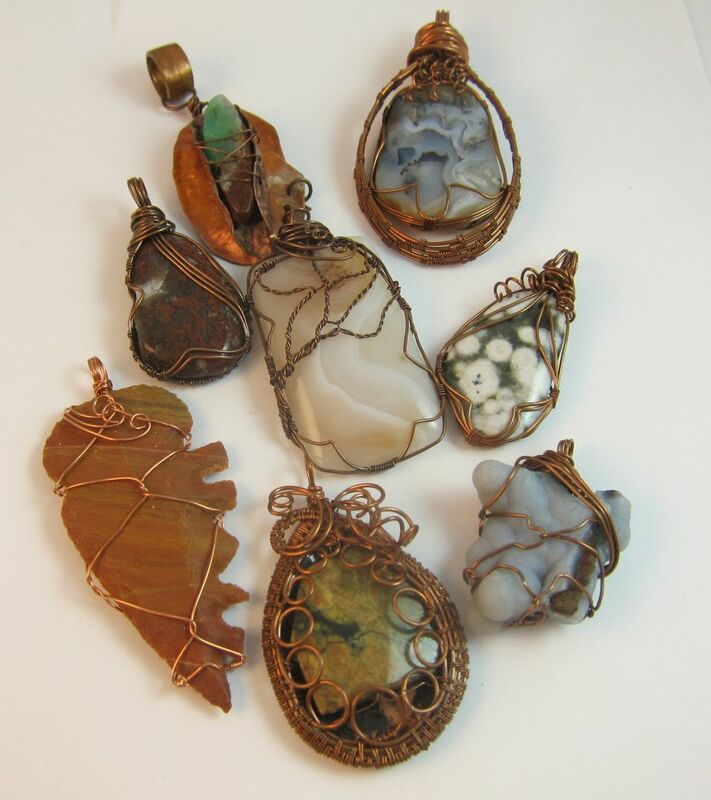 For example, the cabochon wire wraps above show a variety of different ways to capture a stone. Those who are fluent exercise divergent thinking which doesn’t always appear to provide a logical path to a problem solution, but does allow for many possible answers. A porcupine is a good visual analogy for divergent thinking. The animal’s quills go in all directions making it possible for the porcupine to spear a predator from any side. Divergent thinking enables us to “spear” ideas emerging from different categories or from different angles. This flexibility helps increase the number of ideas generated. Just as a flexible athlete bends in many different directions, a flexible thinker generates ideas from many different perspectives. For example, if I were a skilled mechanic what ideas might I have regarding my jewelry problem? Would a seamstress see this situation differently? Would there be other solutions if I examined the problem from a different angle? Flexible thinking is important. Resistance to premature closure greatly impacts idea generation. I had to resist closure when trying to come up with different ways to wrap some of the cabochons in the photo. We want to continue generating possibilities even after we think we’ve found the most suitable idea. By resisting premature closure, we continue to look for other possibilities. While we may, indeed, later determine that we had found the best idea earlier, we can’t know that until we’ve explored all the other possibilities we can think of. Resistance to premature closure is not the same as procrastination. I think of it as the “let’s keep going” principle of idea generation. Some may say creative thinking merely involves the generation of unusual ideas through divergent thinking, but convergent thinking is also vital. It’s the more logical type of thinking that helps us plan, evaluate and make decisions. 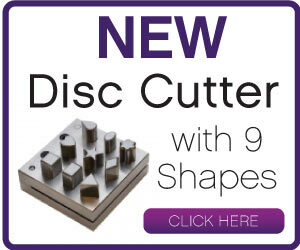 We definitely need this in making jewelry in order to make a decision and get something finished. The ability to think convergently is also a part of being creative. We use convergent thinking when selecting the most usable ideas and then perfecting them. The term originality is not a mystery. Original ideas are unique and different and we can be hopeful that we find something original among the many brainstorming ideas. Is there one idea that can be developed and will it be different from what we’ve done before? Is there a wire wrap in the cabochon photo that is original? I believe selecting an original idea requires both convergent and divergent thinking since we must both evaluate and recognize potential. Elaboration is another major component of creative thinking. When we run with an idea by fine-tuning or embellishing it we are elaborating. What do we need to add to the idea to make it usable? You can see that I found a variety of ways to elaborate upon the basic cabochon wrap. Elaboration might also involve planning the steps needed to utilize the idea. Sometimes the idea we actually use has little resemblance to the initial thought due to the development of it. Again, we need both divergent and convergent thinking to be elaborative. 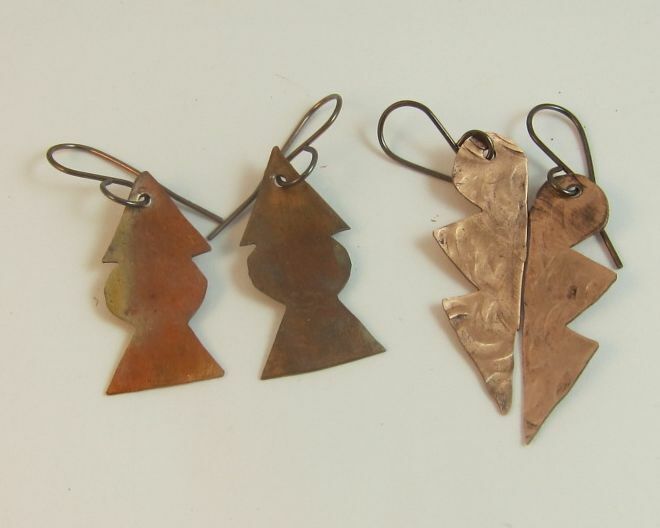 Let’s consider new ideas for copper earrings as an example for the above information. I recently noticed that my copper earring inventory was quite low at one of the stores where I sell jewelry. I needed to add some pairs made from copper sheet and wanted to do something a little different. I tried to be fluent by brainstorming the shapes that I might employ for copper earrings. You can see that my first ideas were fairly common shapes. I resisted premature closure and as I continued brainstorming I became more flexible in my thinking. I stepped away from jewelry shapes and tried to think about shapes in the sky and shapes in the garage. I ultimately thought about shapes on top of shapes. I was able to add more ideas by changing my perspective. I circled the ideas in the photo below that were generated from different categories. Were there any original ideas among those I drew? 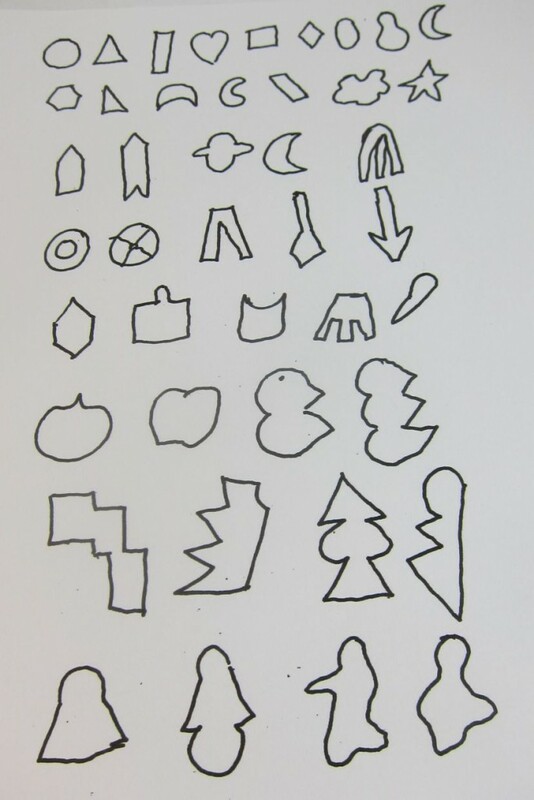 I was looking for a shape I had not previously seen or made and I noted those by putting a star beside anything that seemed original. You can see these in the photo above. I was pleased that I produced something usable, but this is not always the case. Some of my brainstorming sessions don’t produce what I hoped; but even if I go back to my old idea, I do so with the knowledge that it may be the best one. I elaborated upon these shapes playing with the proportions and the size and eventually went forward with two of the shapes I particularly liked. I torch-painted one pair of earrings and used Perma Blue, a gun blue product, to patina that other textured pair. 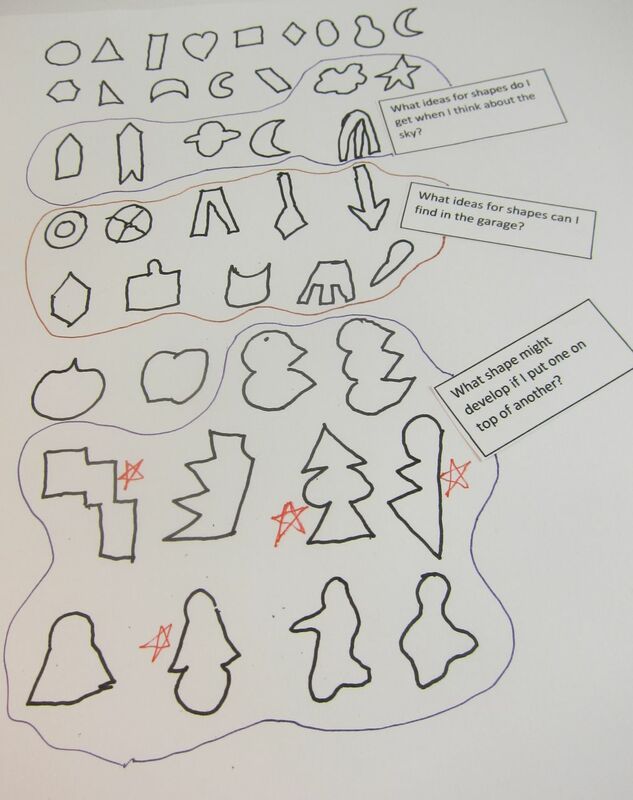 There are other shapes generated in this exercise that I believe have possibilities for my work. Here’s the good news. Fluency, flexibility, originality, elaboration and resistance to closure can be improved through practice. Think of it like starting to exercise after a long period of being sedentary. The first exercise period may end up being short and perhaps a bit painful; however, continued sessions over time become easier. It’s the same with creative thinking. We have to get our brains past the strain and into the creative thinking groove. Once we become accustomed to resisting closure and being fluent, flexible, original and elaborative we enhance our chances of making more unique jewelry and see ourselves as creative thinkers. In Part IV of See Yourself as a Creative Thinker, we’ll examine a specific strategy for generating idea. I think you will enjoy trying SCAMPER.